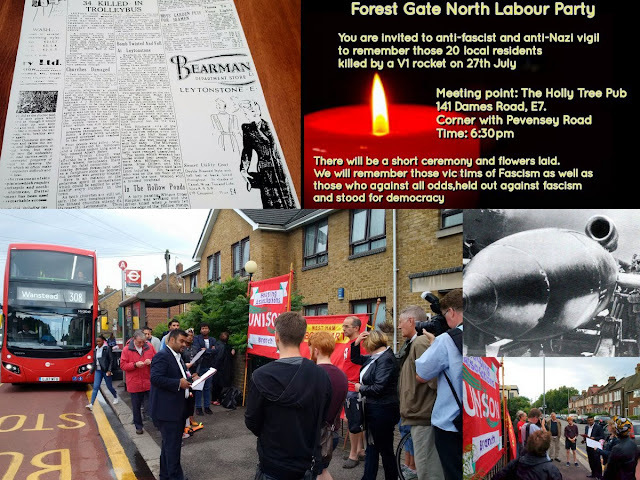 Above is a picture collage from this evening's anniversary vigil to remember the victims of a Nazi Flying bomb attack on this day 27 July 1944 which killed horribly at least 38 East Enders (updated figure) at this very spot. Forest Gate Councillor, Anamul Islam, read out the speech below, While Councillor Rachel Tripp read out a message of support form our West Ham MP, Lyn Brown. We had leafleted the local area beforehand about the event and I was really pleased that a 80 year local resident, who remembered the atrocity turned up to point us out to the exact location of the attack and give us the copies of the newspaper reports in top left of college. Another resident offered help with the funding of a permanent memorial to the victims (what a good idea). Many thanks to "E7 now and then" website for providing historical content and Councillor Seyi Akiwowo, for organising leaflets and publicity. Cllr Islam "I would like to start in the first instance by thanking everyone for making the time to come to mark an important moment in our local history. During WW2 Newham was one of the most badly damaged parts of London. The bombs came in two waves - the Blitz of 1940/1 and the V1 and V2 raids of 1944/5. Forest Gate was less badly hit than other parts of Newham such as the dock area, but nonetheless we suffered almost 200 recorded direct hits during the Blitz and about 50 V1 or V2 rockets- but each one was far more lethal- killing at least 70 civilians in total. This evening we remember the dead of one of the most horrific attacks- when a doodlebug struck the corner of Pevensey and Dames Roads, hitting a passing trolley bus. It was near Holly Tree pub- where we stand today- on 27 July 1944. The bomb caused mayhem- just how much is unclear. There are no reliable contemporary accounts as the press at that time was heavily censored so as not to give too much information to the enemy. The Stratford Express was the local paper at the time and was only able to report that a number of buildings close to a public house were damaged. The public house was not named.We know today it was the Holly Tree, where we stand near bye. The account went on to name four passengers who were killed. It hinted that others were killed or wounded but did not give details. After the war official Air Raid papers named a further four people who were killed that night- almost certainly by the bomb.We know the names, therefore, of eight people killed but following the published memoirs of West Ham’s Chief Fire Officer, Cyril Demarne, we know that probably dozens more died that day as a result of a fascist terror attack. Fire Chief Demarne described the Dames Road bomb as ‘the most horrific thing I have ever witnessed’. His full memoire was published in 1980 by the Newham Bookshop. It is doubtful that we will ever know the full scale of the death and casualty toll of this dreadful bombing. If there are any lessons to be learned it is that we should never ignore the rantings of seemingly mad fascists and racists, whether they wrap themselves in a black shirt or in the Union Jack. Now, just as then, the price we pay for liberty is eternal vigilance against racism and prejudice. Let us never forget the dead of this awful bomb blast, or the lesson their destruction leave us. We will now have a minutes silence. Council and school workers deserve a pay rise!